Home » News & Events » News Releases » Opioids without the risk of addiction? 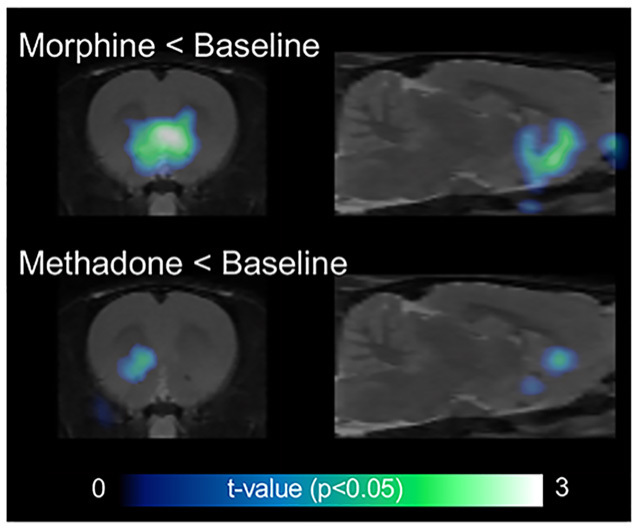 The investigators found that the opioid-galanin receptor heteromers determine the different effects of methadone as compared to morphine and fentanyl, showing methadone with a weaker ability to activate the dopaminergic system linked to the euphoric effects of opioids. These results should advance the search for opioids less likely to attach to opioid-galanin receptor heteromers, exemplified by methadone. This finding also enables the search for compounds that activate galanin receptors, which would be expected to reduce the abuse liability of opioids. The research was done by scientists at NIDA’s intramural labs in Baltimore, the University of Maryland, Harvard Medical School, and the University of Barcelona. For a copy of the article, published in Journal of Clinical Investigation, go to Opioid-galanin receptor heteromers mediate the dopaminergic effects of opioids. For more information, go to Opioids. NIDA. "Opioids without the risk of addiction?." National Institute on Drug Abuse, 26 Mar. 2019, https://www.drugabuse.gov/news-events/news-releases/2019/03/opioids-without-risk-addiction. NIDA. Opioids without the risk of addiction?. National Institute on Drug Abuse website. https://www.drugabuse.gov/news-events/news-releases/2019/03/opioids-without-risk-addiction. March 26, 2019.